After a number of articles on rune-stones, Professor Birgit Sawyerhas written a A book that can be read as a synthesis-for-the-time-being of her rune-stone studies (The Eking-Age rune-stones. Custom and commemoration in Early Medieval Scandinavia. Oxford 2000). That makes it an interesting book and promising one. It is also a book worrh discussing. 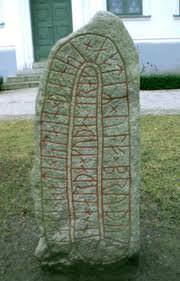 In spite of all its virtues I will present some critical points ofview mainly on the author’s use of rune-stone texts in the study of inheritance. The chapters on inheritance are central, but running through the table of contents, the fact that there is an excursus within the survey makes a reader curious. By definition, an excursus will digress and go beyond the scope of the investigation. For that reason it can be instructive to begin a book with the excursus in order to form an opinion about the kind of discussion and hypothesis that does not fit the main line of argument. In this case, reading the excursus first happens to be rewarding. In an English book on the nature of history, in a passage about the scholarly historical text, a woman, no doubt the English Lady, is said to have expressed her surprise that these texts are so dull, given the fact that they are 90 percent pure fantasy This anecdotal comment springs to mind when reading The tug-ofwar over Thyre. This text demonstrates that if the fantasy level is allowed to rise above 90, the whole thing becomes fun. There is a risk, of course, that one or two among the poor in spirit will be enchanted, but I for one feel immune, having indulged in Ungdommens Bog om vort Land – ‘The Youth’s Book about our Country’ (i.e. Denmark) already as a child. Since then, Thyre, Gorrnand Haraldare my friends – today, however, for the fact that so little can be known about them. They survive becake they have exchanged limelight for obscurity and become Rode Orm material.